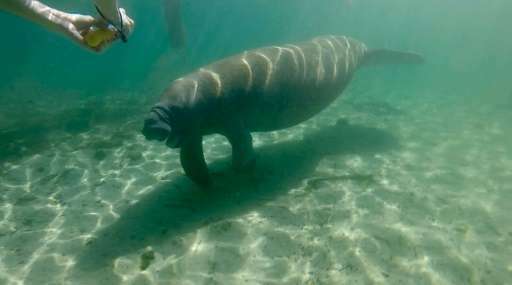 Manatees are no longer an endangered species, US officials said Thursday, declaring success after decades of efforts to rebuild the population of the chubby sea cows in Florida and the Caribbean region. The population of West Indian manatees in Florida is now around population of 6,620, "a dramatic turnaround from the 1970s, when just a few hundred individuals remained," said a statement from the US Fish and Wildlife Service. Manatees are now considered "threatened," meaning they are protected under the Endangered Species Act but are no longer considered in imminent danger of extinction throughout their range. The decision applies to West Indian manatees, which includes the Florida manatee subspecies, found in the southeastern United States. It also applies to the Antillean manatee, found in Puerto Rico, Mexico, Central America, northern South America and the Greater and Lesser Antilles. "While there is still more work to be done to fully recover manatee populations, particularly in the Caribbean, manatee numbers are increasing and we are actively working with partners to address threats," said Jim Kurth, the US Fish and Wildlife Service's acting director. "Today we both recognize the significant progress we have made in conserving manatee populations while reaffirming our commitment to continuing this species' recovery and success throughout its range." The proposed downgrade in status for manatees, announced last year, stoked controversy, as some experts warned the long-protected sea cows were still vulnerable to problems like boat collisions, climate change, pollution, and loss of habitat. The decision "will not diminish any existing federal protections that will continue to play a vital role in the recovery of the species," said the Fish and Wildlife Service statement. "The manatee will also continue to be protected under the Marine Mammal Protection Act." Manatees were among the first animals listed on the Endangered Species Protection Act of 1966, along with red wolves, grizzly bears, whooping cranes and American alligators. One of their most famous advocates is "Margaritaville" singer Jimmy Buffett, who co-founded the Save the Manatee Club in 1981.